Having a greenhouse, and there is no easy way of saying this, will make the task of raising and overwintering exotic plants much easier. Connect it to the mains and life becomes easier still. The greenhouse mid January 22.20 GMT. Whatever size you chose, you will manage to fill it. Worst case scenario, if you get a slightly too large greenhouse - you will be able to move around it without breaking your neck. The height of you greenhouse is particularly important. If you enjoy growing the Abyssinian banana for example, the higher the ridge, the bigger the plant you can overwinter. A nice high ridge also means you do not have to spend all your time greenhouse gardening with a stoop. Some manufactures offer a bespoke service (usually the - you can have any shape you like so long as it is one of these, type of thing) so if you have a small garden it is worth seeing if you can get a small (area) greenhouse with good height. Windows are very important in a greenhouse. They allow you to ventilate the greenhouse. 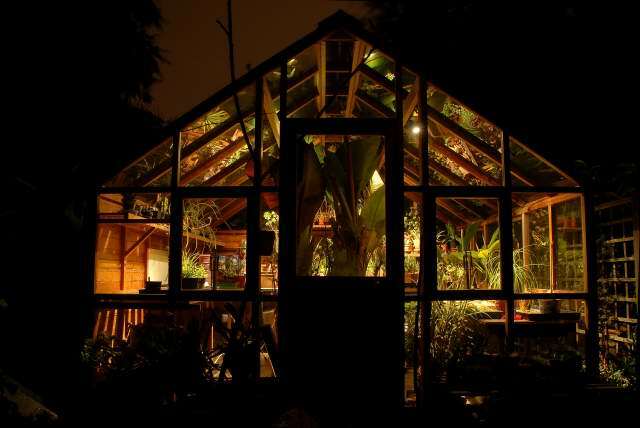 The air in a greenhouse full of plants soon becomes damp and stagnant. Good ventilation helps to reduce this. When the sun comes out the temperature rises significantly. Having windows in the roof and sides is essential to allow a good air flow to cool things down. Side windows or roof windows alone will not ventilate adequately. Used together the whole convection thing kicks in, hot air out of the top, cool in through the sides. One often overlooked factor about ventilation is a plants requirement for carbon di-oxide. In an unventilated greenhouse the plants soon deplete the available carbon di-oxide and put growth on hold. Good ventilation provides your plants with all the carbon di-oxide they need. Make sure there is a close fitting door. Heat loss in the winter due to an ill fitting door will be high. Theoretically the ideal spot for your greenhouse, to ensure the most successful greenhouse gardening, will be in a position in full sun. The greenhouse should sit with its long axis running east to west to ensure the maximum amount sunlight enters the greenhouse. However this may not always be possible or convenient. You may wish to use the sunniest spot in the garden for other purposes. Still, try to get the greenhouse in an area where it receives plenty of light. A north facing lean to greenhouse will have a lower productivity than a greenhouse in full sun, but if that is the only place it will go, its better than nowhere. No end to the amount of unwanted creatures entering the greenhouse via the soil.